Back in the dim and distant past much of what is now Swansea Bay was peat bog and forest which, for some reason (still not properly understood) was inundated by the sea. The comparative shallowness of the water, together with the fact that the Bristol Channel has the second highest tidal range in the world, combined to create wide sandy beaches around the margins of the bay thus formed. In turn dunes formed along the fringes of this strand as sand was carried by the wind above the high water mark. At one time dunes systems were to be found along almost the entire seaboard of Swansea Bay, but now these have nearly all been destroyed and submerged by urban and industrial development. Today Kenfig is the only sizeable tract of this former landscape still surviving. What is remarkable about the Kenfig Dunes is the distance they formerly extended inland. Fields as much as two miles from the coast formerly bore names indicating the sandiness of their soil, and a few years ago an archaeological excavation at South Cornelly showed a thin layer of sand had even been deposited there. by the Normans in the mid 12th century. Evidence from the analysis of peat samples taken from the former land surface underlying the dunes, and the Kenfig Society’s own excavation to the west of the castle, indicate that a bare century later the sand had already advanced a considerable distance inland. By the early 1300 hundreds it was starting to affect land immediately adjoining the town of Kenfig itself, eventually causing it to be abandoned in the mid 15th century. The advance continued. By 1570 it had destroyed the windmill on Mont Mawr near Maudlam, and a century later the adjoining hamlet of Millhill also had to be abandoned as it too succumbed to the encroachment. As outlined in the introduction, the principal agent causing the original dune system to become unstable was overgrazing, which was then compounded by the fact that the prevailing wind blows from the west, driving the sand further inland. To make matters worse increasingly high tides caused flooding which helped to accelerate this process. Since almost all the dune area subsequently became common land upon which the burgesses could pasture as many cattle as they wished, the dunes continued unstable up until fairly recent times. Grazing rights were vested solely in the burgesses, so once the Borough was abolished and they gradually died out the over-grazing problem began to ease. More importantly myxematosis all but wiped out the rabbit population, with the result that since the Second World War vegetation has stabilised the dunes to such an extent there is now a serious threat to much of the unique plant and animal life they harbour. In 1971 at the High Court, the Trustees of the Borough of Kenfig won a hotly contested action against the Margam Estate, proving themselves the true owners of the common land in the dunes. As a consequence a nature reserve was established to protect and preserve the wildlife of the area the importance of which was recognised when it was declared a National Nature Reserve. 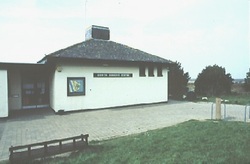 The Dune Centre houses a small but comprehensive exhibition concerning the flora and fauna to be found on the local reserve some of which are now has all but disappeared elsewhere in Britain due to destruction of its habitat.